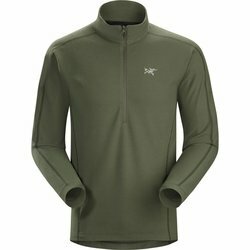 ARC'TERYX Delta LT Zip. The Delta LT Zip microfleece pullover shines as a lightweight midlayer, warm baselayer and even as a standalone. Made from Polartec Classic 100 micro velour small grid, the Delta LT is highly air permeable, dries quickly and packs small. Its low bulk and Trim fit allow it layer easily under a shell or heavier midlayer. Easily stowed in a pack, it also performs as standalone in mild conditions. Use specific design that facilitates the body's natural motion is an essential element of Arc'teryx design. The Delta LT's functional articulation in the sleeves prevents them from riding up when the arm is bent, and gussets under the arms make it easier to extend reach. The Trim fit stays close to the body but does not bind. As a layering piece, the Delta LT is designed to work efficiently with a complete system to conserve energy, warmth and manage moisture.